One of the misconceptions of the re-emergence of the PEPLUM genre is that it started with the success of Hollywood productions like SAMSON & DELILAH (1949) and continued on QUO VADIS (1951) when in Europe the genre was also a hot commodity with successful films like FABIOLA or MESSALINA (1951). 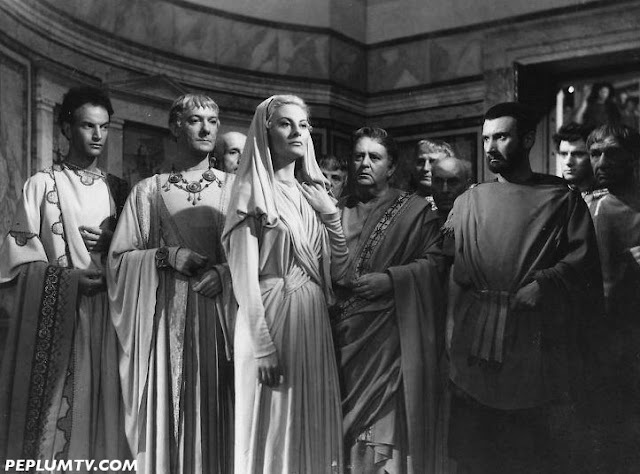 And since QUO VADIS and other Hollywood productions were made in Italy (BEN-HUR, LAND OF THE PHARAOHS, to name a few), it was only normal that the genre would eventually explode into what it became a few years afterwards. So the re-emergence of the genre wasn't only a Hollywood thing. Originally at 164 minutes, the film was released in the US two years later, in 1951, at 98 min. Michèle passed away in 2016. FABIOLA is a first class Peplum that tends to be overlooked, perhaps because it is in B&W. THE QUEEN OF SHEBA is another excellent Peplum which suffers from not being in color. I think Hollywood got the length issue correct during its Golden Age of the 1930s by settling on 90 minutes as a de facto standard. It has been many years since I saw FABIOLA, so I cannot remember how long that version was. Nevertheless, the original release of 164 minutes sounds way too long. One of my fave Hollywood Peplums is DeMille's over-the-top "Sign of the Cross". It's beautiful to look at and delightfully lurid. But the 50's US Peplums almost all became lumbering affairs, devoid of any real romance or humor. They were more like pretty marble statues to be observed from afar, than stories told by someone who loves telling them. The European Peplums, on the other hand, distanced themselves from that crippling reverence, but still managed to infuse their movies with both pathos and importance. What two radically different approaches to the same subject matter!